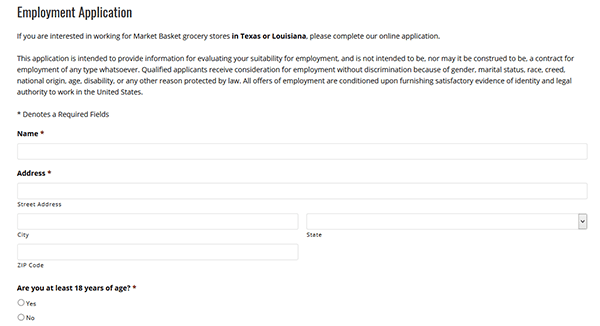 Apply for current openings online using the Market Basket job application. The form is available on the company’s careers page. Click one of the links on this page to go directly to the employment page. Examples of some of the positions that you can apply for online include manager trainee, produce clerk, bakery/deli clerk, bakery/deli manager, and floral associate (to name a few). Follow the steps in the instructions posted below to learn how to properly fill out the form. There is currently no printable/offline version of the form available. 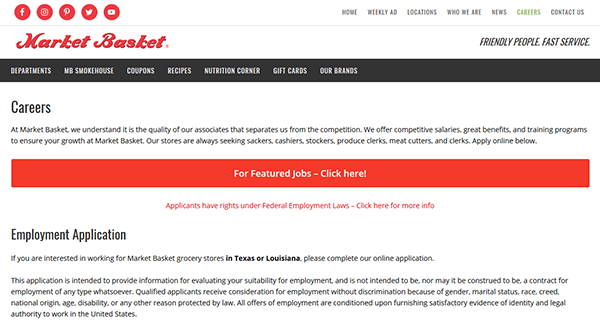 About the Company: Market Basket is an American chain of supermarkets that is based out of Nederland, Texas. The company was founded in 1962 and currently operates over 30 locations throughout the States of Texas and Louisiana. Market Basket employs more than 2,000 people. Step 1 – The first step of the online hiring process is to go to the company’s careers page. Click this link to open this page in a separate browser window/tab. Step 2 – Once you’re on the main careers page, click the “For Featured Job – Click Here!” link to take a look at some current openings. Step 3 – When you’re ready to apply for a position go back to the main careers page and scroll down until you come to the main form. What time are you available to work each day? Why are you choosing to apply to the company?